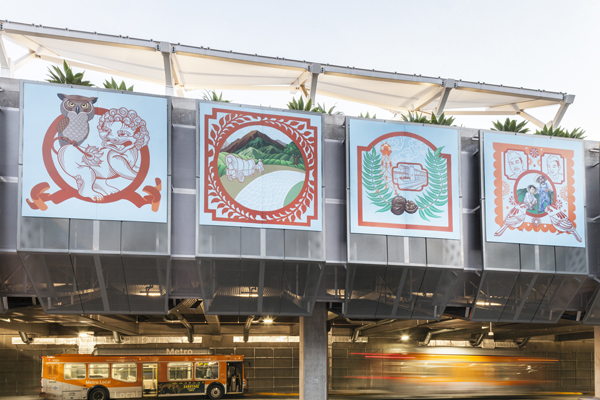 El Monte Station is outfitted with four new artworks that celebrate the cultural heritage of the area and examine the way we cross paths in transit. 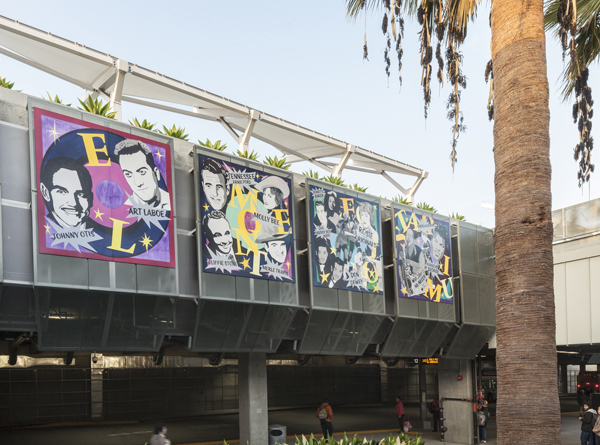 Artists Martin Durazo, Phung Huynh, Vincent Ramos and Eloy Torrez were selected to create artworks for Metro’s El Monte Station, which opened in fall 2012. 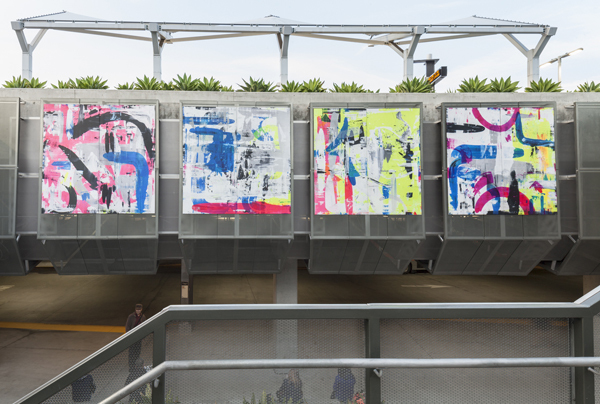 Each created four artworks that were translated into aluminum panels for display in four transit bays at the station. The colorful project brings vibrancy and an improved customer experience to the largely concrete and metal modern structure. The four artists’ statements and project descriptions are provided below to complement your viewing pleasure of their pictured work. The original transit center, built in the 1970s, was the busiest bus-only station west of the Mississippi. It was demolished to make way for a new two-level station, doubling passenger and bus bay capacities and adding bike storage. Additionally, the station greets passengers with an iconic sculpture by the artist Donald Lipski entitled, Time Piece. Phung Huynh’s artwork, In the Meadow, is informed by the city’s rich history through the use of symbolic and metaphoric imagery. “In the Meadow” pays tribute to El Monte’s rich history through symbolic and metaphoric imagery. The stylized treatment of forms and figures are inspired by Mexican and Chinese cut paper folk art traditions and Japanese woodblock prints, which were meant to honor farm workers. Art panels reflect icons and picturesque elements of El Monte’s past. Some art panels depict picturesque glimpses into El Monte’s idyllic, agrarian past. In another art part panel, a Chinese lion reflects the historic lions in El Monte’s famous Gay’s Lion Farm of the 1920s and 1930s. The powerful image of the lion is also the El Monte High School mascot. 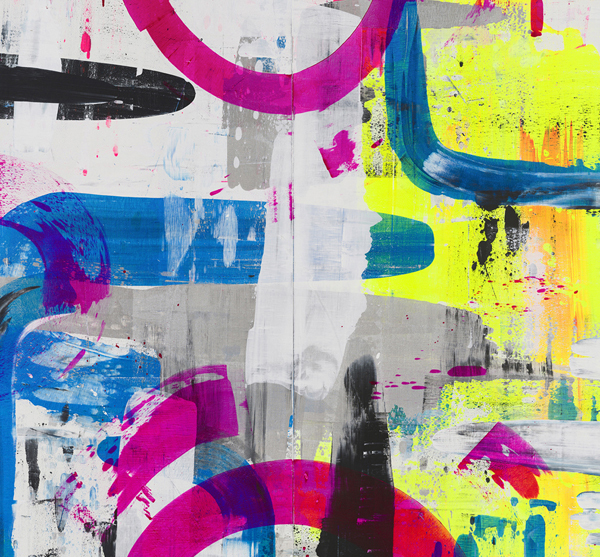 With Vamos Juntos/Juntas, Martin Durazo uses swirling vibrant colors to energetically convey the ever-changing intersection of cultures and environments in the Los Angeles area. Through the use of swirling vibrant colors such as metallic blue, electric yellows, pinks and silvers, Martin Durazo captures the energy of people traveling. His meaningful use of color includes the use of metallic blue as an ode to the California seashores meeting with the metal of man-made, transportation-based culture. The ground colors reflect the landscape of Southern California. Vinvent Ramos pays homage to the rich cultural contribution of the El Monte Legion Stadium, a hotbed of activity in its heyday though El Monte Legion Stadium Nocturne. Vincent Ramos acknowledges local history by paying homage to the rich cultural contribution of the El Monte Legion Stadium. The stadium was a hot bed of activity in its heyday. At a time of severe racial divide, the live music and sporting events that took place there brought people of all races and colors together from all over Southern California. The artwork focuses on the musicians who played at the stadium and the promoters (radio deejays and TV personalities) who organized and hosted these events. Eloy Torrez explores our momentary encounters as we cross paths with each other in our daily lives and within the transit environment in The Steps We Take. A series of four art panels depict momentary encounters of people crossing paths in their daily lives. The images visualize the movement, energy and unintentional patterns people create during their travels. These paintings are about the journey, reflecting quiet encounters that significantly contribute to the environmental conditions of commuting. Click here to learn more about Metro’s art program. Good. Now Metro can create postcards and TAP cards based off of these artworks. And they can sell it on the Metro Store and scam the people with $5.00 in shipping and handling to send out postcards. I’d like it if they just tried to open the bike hub – still closed despite originally being scheduled to open with the station – and not spend the money on art. Or reconfigure the bus bays to avoid a double loop required when the Silver Streak pulls in eastbound. MTA BOONDOGGLING at its finest! And they made such a big deal when the “clocks” were installed at the FRONT of this bus station (that NO ONE ever pays any attention to!). And yet $60 MILLION was spent “upgrading” this station, that comes with an EMPTY BUILDING (for staring purposes!) apparently! Why didn’t they just use this space for huge digital LCD displays that rotates between showing artwork, showing something useful like bus arrival times and estimated travel times, weather, news, and advertisements? Now it’s just useless pieces of overpriced artwork that sits there that collects dust, that no will care about, will grow old in about a week, that taxpayers have to pay for their upkeep, shows nothing informative to the traveler, and generates no additional revenue to Metro. Thanks again for wasting our money Metro. WestLAer made a really excellent point here. All these artwork could’ve been easily be in digital form and displayed on a huge outdoor LCD displays like those you see in NY Times Square or LA Live. 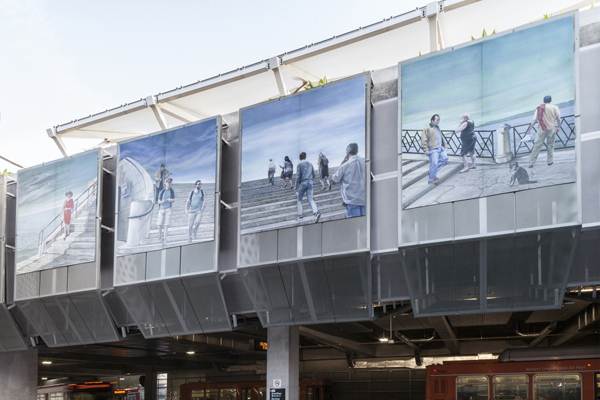 The difference with LCD displays is that it can change constantly with other images, advertisements or useful transit information – it’s more fluid and dynamic than showing the same static artwork image. Couldn’t you guys have made a deal with Panasonic or Samsung and installed LCD displays instead? So much more could’ve been done with LCD displays than static artwork and you just wasted a perfectly good space for them. The MTA cannot even find a tenant for the EMPTY BUILDING it has at El Monte Station (that has REMAINED EMPTY since the “new” El Monte Station opened over 1-1/2 years ago!). The so-called “public art” at the FRONT of the station (the clocks!) are completely ignored by those using the station as well (more of the MTA’s finest taxpayer BOONDOGGLING!). You think they really could be so “advanced” as to use LCD’s for “art”? Please. Look at the these examples (and this latest one!) as PROOF of the MTA’s incessant waste of taxpayer dollars! Remember-this “transit station” is also supposed to “accommodate” articulated buses as well. NOT ONE has been to or through El Monte Station since it opened 20 months ago! If the money spent on this art project could’ve went to fixing the TAP website which is actually useful to transit riders, we’d have a world class contactless transit system by now. Calling out against wasteful government spending is not “whining.” It’s the taxpayers’ right to object to the irrational workings of government bureaucracies. Money doesn’t grow on trees. The money spent on this artwork comes from taxpayer dollars. We should be able to decide how our money gets to be spent, not special interest groups and lobbyists who control government.